Convenience has certainly made its way to the baby food industry in recent years. Gone are the days of lugging around a range of bulky, fragile glass jars in the diaper bag. 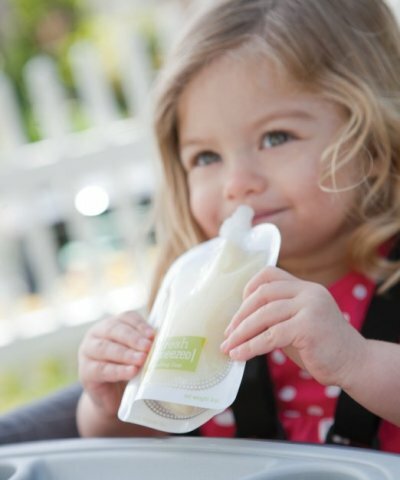 Nowadays, squeeze tubes of fruit and veggie puree are the way to go when you have a little one in tow. The packs are durable, portable and ultra convenient. The only downside - the cost. Those handy packs can really add up when your baby is sucking them back on a regular basis. This is where the Infantino Squeeze Station comes in. 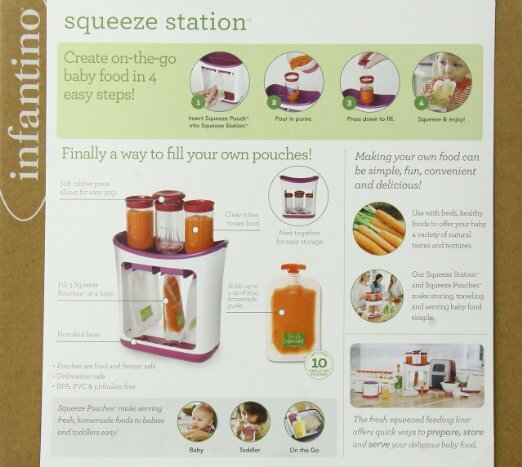 The Squeeze Station allows parents to easily prepare their own baby food pouches. This gives frazzled parents the opportunity to not only save money, but also create super fresh, healthy custom food pouches. The Squeeze Station is pretty basic to use. You simply mix up your own puree or select a pre-made soft food that you want to add to the pouch, pour it into the upper containers of the unit, and plunge into the empty food pouches below. Filled pouches can then be capped and stored in the fridge or freezer until needed. Infantino has made the product extra easy to use by adding a non-skid base and soft press system. The product is also quick to clean, as it is safe to put in the dishwasher. The unit comes with some pouches and lids, and additional ones can be purchased as needed. Of course, the pieces are BPA, PVC and phthalate free. To check out the reviews on the Squeeze Station or to pick one up, click here.